The Steelers defense came to play Sunday, sadly it wasn’t enough as the Bengals took advantage of a couple huge Ben Roethlisberger mistakes in the fourth quarter and left Heinz Field with a hard fought 16-10 win. The loss drops the Steelers to 4-4 on the season, and the Bengals are now 7-0 for the first time in franchise history, and with the win basically have a lock on the division. The Steelers had the lead at 10-6 in the fourth quarter and it looked like it was going to be a huge win after Mike Mitchell intercepted a third down throw by Andy Dalton as he was looking long for A.J. Green. Instead, Roethlisberger on second down scrambled, and threw an awful pick on the sideline as he was looking to sneak a pass into fullback Will Johnson. Shawn Williams picked off the pass for Cincinnati, and drove downfield and finally got their first TD of the day after Dalton hit Green with a 9-yard score to make it 13-10. The key play of the drive came on third down when under pressure Dalton executed a perfect shovel pass to Giovani Bernard that went for 23 yards to the Steelers 17. After the Bengals score, Roethlisberger on first down from his own 20 overthrew Antonio Brown, who scored the only Steelers touchdown, and Reggie Nelson pulled it in. The Bengals got a field goal which made it 16-10. With a last shot, the Steelers drove inside the Bengals 20 with 4 seconds left, but Roethlisberger threw the final pass of the game out of bounds, hoping to get another play, which he and the team didn’t. The Steelers are now 2-5 overall in the first game Roethlisberger plays after injury, and this one is a heart breaker based on how well the defense played. The Bengals had scored no less than 24 points in any one game this season, but the defense had them at 6 until Green pulled in the winning score with 3:01 to play. On the day Roethlisberger was 28-for-45 for 262 with a touchdown and three picks. The last two picks killed any real shot the Steelers had to pull out the win. Another huge part of the loss was the team losing running back Le’Von Bell to a serious knee injury in the second quarter. On a hit going out of bounds, it appeared Bell’s knee got caught and twisted the wrong way. There’s no official word from the Steelers as to how long he will miss, but much like Ben it looks like it will be multiple weeks. DeAngelo Williams ran for 71 yards on 9 carries, but one of the 9 carries was a 55-yard run on a drive which ended with Chris Boswell hitting a 32-yard field goal with 6:32 to play in the third quarter. Dalton ended the day going 23-for-38 for 231 yards with a touchdown and two picks. 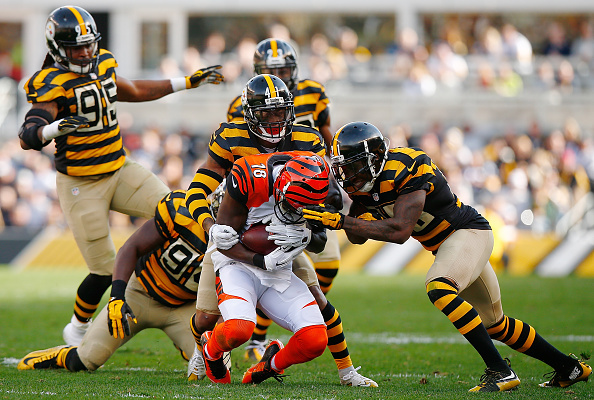 The Steelers outgained Cincy 356 yards to 296 yards, but it didn’t matter. Next Sunday the Steleers are back at home to take on the Oakland Raiders at 1pm. Even Though It’s One Win – Is It Truly A Turnaround? 2 Comments on "Steelers Lose to Bengals 16-10 in Roethlisberger’s Return, Lose Bell to Knee Injury"
I have no idea how badly Bell is injured, and we all hope for the best. But the replay of his injury didn’t look good. So let’s assume Bell won’t be playing for at least a month. Now What? DeAngelo Williams is 32 years old, and he was never expected to be the workhorse for this offense. Behind him we have Dri Archer, who struggles to return kickoffs and can’t run between the tackles and Jordan Todman, who hasn’t been able to beat out Williams or Archer. Not a good situation should something happen to Williams. I submit that Haley should do what I recommended three years ago — run Will Johnson at tailback. He played that position at WVU, he is a powerful runner, and he has good hands. With Roosevelt Nix on the roster, we even have a true fullback to block for him and Williams next week. It’s either that or sign up some other team’s cast off that doesn’t know the plays or the players and wasn’t good enough to find employment elsewhere. It sounds like a no-brainer to me. I noted that Haley did allow Johnson to touch the ball once or twice in the last two games. Given Ben’s ailing knee, I submit that running over the Oakland Raiders is a more tempting strategy than letting their front seven use Ben for target practice. Our O-line might not be able to pass block, but it can run block reasonably well if given a chance to do it consistently. And running the ball will achieve a measure of offensive balance and open up the passing game for Brown and Co. Why not try? It can’t be any worse than what we’re doing now. I agree but Tomlin won’t because he originally deciphered and assessed Johnson as a FB which means he would have to recant somewhat on that assessment thus rendering him erroneous and we all know Tomlin is never wrong because the almighty Tomlin would rather risk sticking to his guns even if they’re wrong than admitting he might’ve made a mistake about a player and have to reluctantly acquiesce to common football sense! Oh my God I hate, I HATE I CANT TELL YOU HOW MUCH I HATE him!